Your conservatory or orangery is one of the most enjoyable places in the home and its pleasure can be more enhanced by choosing the right insulation options. Insulation is a necessity for both warm and cold temperatures, though many consider it only in the winter months. By ensuring your conservatory or orangery is well insulated you are helping maintain a comfortable temperature in which to enjoy yourself. 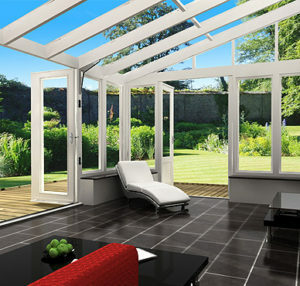 So, what are the conservatory or orangery additions that can make these idyllic temperatures attainable? Solar Glazing Imagine if you could control the temperature in a building through glass, without the need for air conditioning. Well, solar glazing provides you with this option and is ideal for luxury conservatories and orangeries. Solar glazing regulates the amount of heat allowed through glass into the area and so controls the room’s temperature and keeps it at a pleasant temperature. This material is used in numerous buildings and works wonderfully with home conservatories and orangeries as an insulator. Blinds Of course, not all practical additions are high tech and the humble and attractive blind is one of the most functional of all forms of insulation. Blinds come in all shapes, sizes and styles and can not only add insulation from heat and warmth, but also add an element of attractiveness to the conservatory. Choosing blinds should be done for with both functional and aesthetic purposes taken into account. However, as a way of insulating a glass covered area, it’s still one of the best. Radiators Though not necessarily insulation, radiators in orangeries and conservatories can allow you to regulate the heat and ensure that a conservatory is as practical in the depths of winter as it is in the summer time. Most radiators are positioned underneath the windows of the conservatory and remain unobtrusive in most cases. Teamed up with blinds or other insulating additions they can really create a very pleasant atmosphere and temperature all year round. Under-floor Heating If you don’t want radiators in your conservatory or orangery, then the addition of under-floor heating is fantastic. Under-floor heating comes in both electric or also boiler options and fits neatly under the floor of the conservatory or orangery. It creates a more than pleasant sensation underfoot and also allows for heat to transcend the area, thereby creating a very liveable additional room all year round.